You are here: Home / Crafts and Charity / I'm up to the big 10! I'm up to the big 10! Just a reminder that I am hoping to make 200 items for charity this year. If I do, would you donate $25 to either the American Cancer Society or the American Diabetes Association? I’d surely appreciate it!! I posted 3 more items, which takes me to ten. 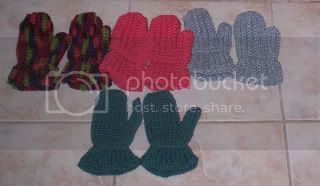 These mittens went to Afghans for Afghans, one of my favorite causes. They are really having a hard time getting items over there for obvious reasons, so when they make a call for items, i try to answer it! The top 3 pairs are mine. A friend crocheted the beautiful pair on the bottom.